Be seduced by the most exclusive resort on the east coast of Spain. cliffs, unexploited and tourist-friendly bays. A strategic enclave which can be easily reached from anywhere in Spain or Europe. -Alicante International Airport 45 mins. Dublin, Cologne, Stockholm, Amsterdam 2/3 hrs. by plane. MEDITERRANEAN and where there are no more buildings, no cars, no noise... nothing but sea and nature. any point on its porch and terrace. 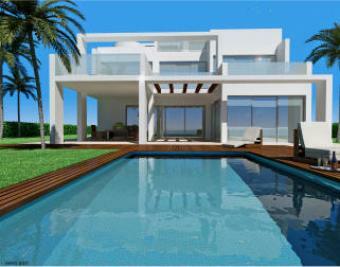 finishes, marble and wood floors, air-conditioning, white lacquered doors and large terraces. room area and shares the same fantastic sea views. of the spacious living-dining area provides spectacular views of the garden and the sea. also to be found on this floor. and terraces with breathtaking sea view. One of these features a spa which also looks out over the open sea. air. A garage for two vehicles is also provide.